Supports Asterisk and Broadsoft for connecting to a wide range of devices. The devices to connect to can be selected to meet customer needs. Supports the G.722 codec. Enables calls with a HD voice quality that makes it seem like you are face-to-face with the other party. Since the device automatically switches to the power saving mode when not in use, no manual operation is required. This contributes to reduced power consumption. The information displayed on the LCD screen can be customised. 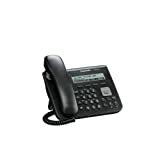 Enables the devices to be used as an information terminal in addition to a telephone. Supports PoE. If you have a power supply hub, no AC adapter is required. This entry was posted in Desktop Computers and tagged Desktop, KXUT123X, Panasonic by Computer Education World. Bookmark the permalink.